Located 44 miles east of Bryce Canyon National Park, Escalante Petrified Forest State Park surrounds the Wide Hollow Reservoir. 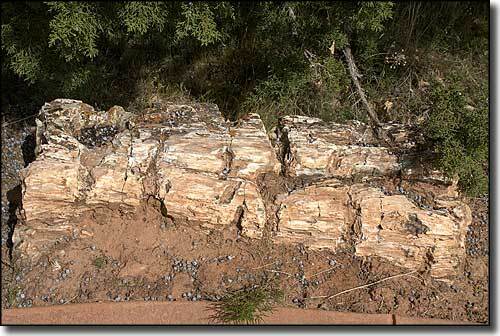 This is an area where you can hike nature trails through the petrified forest and see fossilized dinosaur bones, petrified wood and artifacts left behind by the people of the Fremont culture who inhabited this area about 1,000 years ago. Almon Harris Thompson, a member of John Wesley Powell's survey party of 1872, is the first European recorded to have explored the upper reaches of the Escalante River. He is reported to have named the area "Escalante" as the whole area resembled a set of stairsteps escalating upwards. Wide Hollow Reservoir was constructed in 1954 to provide a stable water source for the town of Escalante. It's a popular place for water sports and is stocked with bluegill and rainbow trout. The park's visitor center was built in 1991 and features displays of ammonite and shell fossils, petrified dinosaur bones and petrified wood. The park has several hiking trails winding through it. 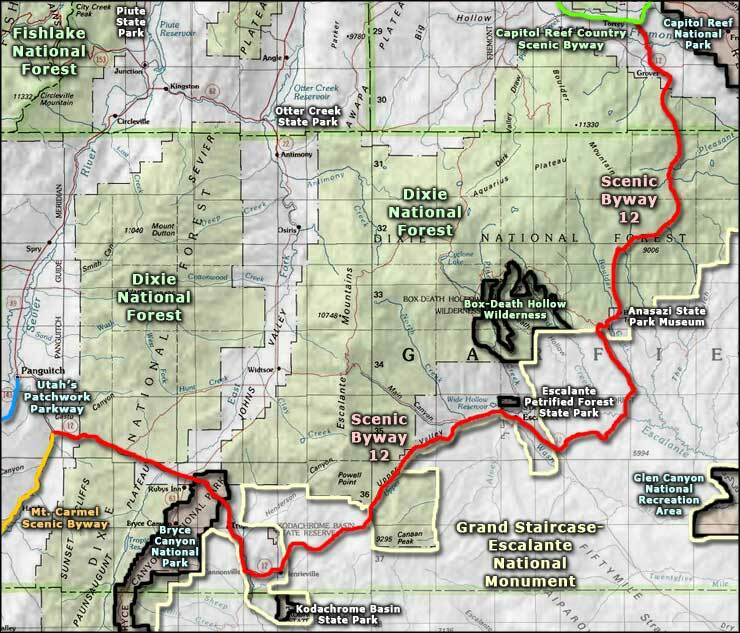 The 1-mile loop of the Petrified Forest Trail winds through the remains of an ancient forest between outcroppings of lava flows. The Sleeping Rainbows Trail is a much steeper 3/4-mile loop off the Petrified Forest Trail that leads to some climbing and scrambling across rocks embedded with fossils. Escalante Petrified Forest State Park is located on Utah State Road 12 (Scenic Byway 12) about 2 miles west of the town of Escalante. In summer, the park is open from 7 AM to 10 PM and in winter from 8 AM to 10 PM. Except for Christmas and New Year's Day, the park is open daily. A day use pass costs $6 while an annual pass costs $75 (and both cover use of the boat launch facilities). Overnight camping in the Wide Hollow Campground costs $16 per night while use of the Group Campground costs $50 per night (5 vehicles, 30 people max. Camping at the Lake View RV Campground offers water and electric hookups for $20 per site per night. The Lake View Group RV site runs $75 per night (one water and electric hookup, 50 people - 8 vehicles max). Park elevation: 5,800'. Acreage: 1,784. Upper photo courtesy of Aneta Kaluzna, CCA ShareAlike 3.0 License.